What do you install first? I recently had to rebuild my Window Vista laptop after a hard disk failure. Here's what I installed, and in the order that I installed it. As I mentioned in my free weekly newsletter, I recently suffered a catastrophic hard drive failure in my Dell Latitude D620 laptop. Fortunately, my data was all backed up so there was no serious loss, but when the replacement drive arrived it did mean it was time for me to do what I frequently end up advising my readers: reformat and reinstall everything. I thought it might be interesting to some to enumerate exactly what "everything" means on my machine. On installing the new drive and seeing that it was working, my first step was actually not to install anything at all, but rather run SpinRite. The intent was to identify and remove from use any bad sectors on this new drive before I began to rely on it. Boot from the DVD installation media, tell it to use the entire disk, format it as NTFS, and install a clean copy of Windows Vista. Visit Windows Update repeatedly and take all available updates until no more were shown as available/necessary. "The safest way to connect to the internet before you're fully patched is through a router." Note that, yes, that requires connecting to the internet with a machine that's not fully patched in order to become fully patched. The safest way to connect to the internet before you're fully patched is through a router. If that's not available, then make sure that the Windows Firewall is on (not to worry, Windows Vista is very insistent as you install it that you do so - a good thing in my book). Drivers: The copy of Windows Vista, although supplied by Dell, didn't have drivers for every possible device that Dell includes on all their computers, and included instructions to visit their web site for the latest and greatest. As it turns out I needed to do so for only one device: the trackpad. A word of caution: make sure you download and install the drivers for the correct version of the operating system you have. I initially made a mistake and downloaded the Windows XP drivers, which installed and appeared to work. The only problem is that I began to experience the "wandering pointer" symptom - the mouse pointer would move at random times and mouse buttons would "click" without being pushed. Once I determined that I'd made that mistake downloading and installing the Windows Vista drivers cleared the problem right up. TrueCrypt: This is a laptop, a portable device I travel with all the time, and keeping my data encrypted is a key part of my security strategy. That, of course, means installing TrueCrypt. Stuff: This is where things get a little geeky and I wave my hands a little and just say that there's are a number of small tools and utilities and scripts and other "stuff" that I simply copy to the machine. As I said, it's pretty geeky (those who recognize will understand when I say that there's a "/usr/bin" folder on the machine). This includes perhaps a hundred or more small tools - Process Explorer is one good example. I also install Perl (a scripting language) at this time, since most of the "batch files" I write are actually written in Perl. FireFox: I run FireFox as my primary web browser and since I'm about to embark a bit of downloading of other programs, FireFox is the next thing to be installed. Roboform: Once FireFox is installed it's time for RoboForm. I also copy over my (encrypted) personal information TrueCrypt container, and instantly have all passwords for all sites I have accounts on. Fired up Thunderbird and began dealing with email. And that "tweak" step isn't necessary if you use Thunderbird's default location for email folders. At this point, I had a working machine. By that I mean that my laptop had been restored to a state where I could use it for my day-to-day operations, and so I did. My laptop was "back in business". Naturally, there was more to install, over time, as I came across other things for which I'd been using the laptop. Microsoft Money: I manage my finances using Microsoft Money, and the data files were already on the laptop by virtue of having copied over the encrypted container. Hamachi: if I'm on the road and want to access a machine at home, it's Hamachi that I use to set up a VPN. Adobe Acrobat: while I often recommend FoxIt, I elected to try the latest version of Acrobat to read PDFs. TightVNC Server: while I can and do use the built in Remote Desktop functionality built into Windows, I also occasionally use TightVNC. Microsoft Office: Word, Excel, Powerpoint - I use 'em. I installed the latest 2007 version. 7-zip: while it's actually part of the "stuff" I copied over earlier, 7-zip is slightly more functional if you take the time to actually run its installation program. VLC: VLC is the media player I use most often these days. My laptop often accompanies me on my treadmill as I exercise, and I'll often be listening to Security Now using VLC as I walk. TopStyle: TopStyle is my HTML/CSS editor. I'm writing this article using it. VIM: VIM, or GVim, is my text editor. Older than dirt, perhaps, but it's reliably present on every platform I can ever imagine using. That's about the point I stopped keeping track. As with all computer geeks, I'm sure there's stuff that I've installed since, and some of that has even already been uninstalled, but that's the way of computers. Someday, due to replacement, hard disk failure or just software rot I'm sure I'll repeat the exercise. I haven't yet installed anti-virus software. Don't be like me: install something right after making sure Windows is fully up to date. (Windows Defender was automatically installed as anti-spyware with Vista). Besides being extremely internet savvy and able to avoid viruses on my own, I'm considering which package to install and perhaps evaluate as part of that process. I didn't talk much about data. First, I have to reiterate that I did not lose any significant data due to having a well thought out backup strategy. Restoring data that I cared about was as simple as copying the files or entire folder trees back over from my desktop, as needed. Time: all in all, it probably took maybe 4 hours of my time over the course of a couple of days to get my laptop back into its fully usable state once again. Many of the operations, like installing Windows itself, are "start it and walk away for a while" kind of things. What kind of maintenance should I do to avoid software rot? Regular maintenance of your computer can help keep it performing well, but some things like software rot, can only be delayed not avoided entirely. I visit this site on a daily basis, I enjoy reading what you write and it is also quite informative. I am a PC consultant by profession, and I had the exact HD issue like yours. But, I do it differently and I think a lot easier and faster than your restore method. I agree to test the new HD to make sure it is healthy before the restoration work. The first replacement HD that Dell sent me was defective too. I like Dell too, been using them exclusively for 10 years. But, Dell should and must stop replacing their HDs with refurbished ones. My 2 replacements were refurbished, and I hate that. Dell cost me a lot of wasted time and effort. After making sure the new HD is healthy, SpinRite is a very good method, I use and recommend a fantastic backup/imaging software, Acronis. I have made a boot CD with Acronis, so I can restore my backed up image from an external USB drive (which I backup at least weekly) on a virgin HD (without OS) in less than half hour. Acronis is great in recognizing connected USB drives. My method is a lot faster and more efficient than yours. I also do backups on a daily basis the important files that I create/update to a USB flash drive. These also get restored after the Acronis image restoration. So in about 30 minutes I am up and running like nothing has happened. Try it, and you'll like it. I'm also an Acronis fan, and if this happened more frequently to me I'd absolutely do something along the lines of what you describe. Less and less over time, I can tell you that. The more often I build out a new machine, the more I simply accept the default behaviours in many, MANY aspects of the system operation. In this case I think I told the security center to stop complaining about my firewall and antivirus, I turned of UAC, and ... that might have been it. It's also something that happens incrementally over time too, so there may be more minor tweaks to come, but I no longer have a long list when I start. rs and thus, consider changes to mine. Thanks. 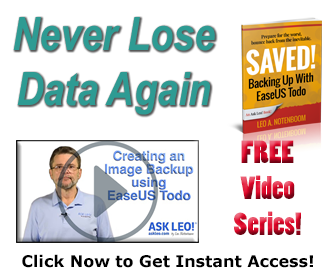 if your backups were image files, you would only have to restore the image backup and you would get everything back in one go very quickly exactly as per the last good backup. This is far better than having to format and reinstall. The same thing happened to me and after fitting my new hard drive, I was up and running withing the hour. I use Acronis True Image which backups my machine daily incrementally. It takes a half hour despite having 2x large hard drives. You could fo course even make an image file of just your basic system with drivers installed put it on a DVD and use that to get back quickly to that point. Repeating what I said to a previous commenter I believe, but yes: if I did this more often, that's exactly what I would do. I'm a fan of Acronis for this reason, among others. Comments on MY "safety net"
- Check drive: absolutely! SpinRite is great, so are manufacturer-specific utilities. BUT: with drives as large as 2TB that takes a long time. So plan to walk away and do something else for a day or so. - Partition the drive: I always use a "program" drive and a "data" drive. If I only have one physical drive, I partition it. That way, if your program drive gets "hosed", your data are still safe. - Intermediate images: I take one "starter image" after installing and updating the Os as well as the drivers. A second "Full" image gets created after the essentials are installed. (in my case, AV software, Backup software, Office.) Also, associated data files get re-located. For example Outlook will get pointed to a mail file located on my "Data" drive. Additional "full" images are created periodically. - Store the source: Every piece of downloaded software is stored in a "Source" directory on my "Data" drive. That way, I don't have to download things like Acrobat Reader etc if a re-install is required. Even drivers and purchased software are copied to my source directory: that saves me from having to hunt for the original CDs. - Keep notes: I have an Excel Spreadsheet where I note down every change I make as well as the points where I take full backups. I embed links to the source where applicable. Thus I can just click on the link in the Excel file to re-install a dozen or so utilities in succession without having to hunt for the location of the source. (Yes, that does require more discipline than most people can muster). - Consider using removable drives: My program drive is mounted in a caddy that can be removed in a second. Once I have installed everything, I make a "final" full image and then restore that image onto an identical drive mounted in the caddy of a removable drive. I then stash the caddy with the original drive in a safe place and start running my day-to-day work from the restored copy of my program drive. Now, if a disaster happens, I can just shut the computer down, replace the corrupted drive with the backup drive (actually the "original") and I'm back up and running within minutes. I use Carbonite that way I don't have to remember to do anything. 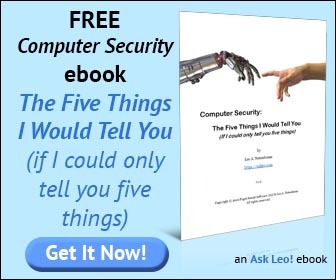 Hi Leo, I use John Haller's Portable versions of Firefox and Thunderbird. I install on my HDD which involves running the installer initially and pointing to a folder on my HDD instead of a thumb drive. Nothing is written to the registry. After installing I customize etc. and save copies of the folders FF and T-Bird are installed to. I then only have to copy the folders to the new drive and create shortcuts to the executables. If your drive is so corrupted that you have to start from scratch (see Leo's premise of a "catastrophic hard drive failure"), Carbonite won't save you. At a minimum, you will have to install the operating system and Carbonite itself. That is, if, at some point, you have taken a FULL backup rather than running with the default. ("By default, Carbonite backs up everything in your Documents and Settings folder"). Also: Ever tried backing up a multi-terabyte volume online? I use Microsoft's Home Server to back up my three clients. I pick and choose what I want to back up and each night it backs them all up. I can restore any of the three with the restore function. Thunderbird has a portable version for use on a thumbdrive. I recently had a HD failure. When I would sometimes get �bootable disk not found� on starting the PC, I should have known the HD was going. 1. I format the HD with FDISK formatting the C drive to be in FAT32. The C drive uses the entire master HD. I have an old PC that accepts the 98SE ESD floppy. I format the HD in the old PC and then install it on my primary PC when formatted. 2. Then I install XP Home and have XP convert the C drive to NTFS. 3. I then update Internet Explorer to the version I want. 4. I then install Norton firewall and anti-virus and download the updates. 5. I then run the Norton maintenance routines (registry repair and defragging the drives). 6. I then go to Microsoft Update and download only the �express� high priority updates. 7. I then hook up the slave drive that has all my data on it. All my data partitions are FAT32. 8. Next I run a full system anti-virus scan. 9. Microsoft Office XP Pro 2002 is then installed. (Word, Outlook, Excel). 10. I then install third party programs as needed. I agree with Dave - Acronis the way to go here... I can't tell you how many times I have just "restored" instead of toubleshooting a computer problem - saves me time and phone calles (i.e. money) to Microsoft to get help. I don't like having one large partition, instead, my preference is for two partitions. Windows and installed applications go into the C disk partition and my data files into the other partition. This is done, mostly, so that image copies of the C disk can be made quickly and are not that big (less stuff to copy). Also, image backups can be restored without clobbering data files. Disk image backups of the C disk are made once a month prior to installing patches, while data is backed up daily, at the least. There are lots of details of course, but this seems like the best general approach to me. I use and recommend Macrium Reflect (either free or paid version). I've rebuilt my computer after a complete failure in less than two hours. Make a fresh image once a week and you�re covered. You can even mount the image as a drive to restore individual files if you wish. I have used the "RAW" formatting on three occasions One my own 500 gbs hard drive and twice on other friends h.d's. Useing raw has on all three occasions resulted in the seemingly corrupt h.d. being restored (almost) to a 'before' corruption state -naturally without any data. "RAW" is available in windows x.p and Vista. Three out of three is not bad. I suggest people try it before discardind the h.d. I'm a bit disappointed that you didn't say that you restored an Acronis image. I've often wondered if it's better to reload all the software and then reload the backed up "My Documents". Good point. I actually turned it into an article: Why didn't you restore from a Disk Image? The link you provided in the comments for "Why didn't you restore from an Disk Image?" doesn't work. I'm especially curious because I took your advice to use True Image a long time ago, but I've been having lots of trouble with it recently and their help hasn't helped much. I'm using version 10. I'm unable to update because my slow dialup prevents it. I believe there's a problem with interactions with AVG anti-virus, but even turning it off while trying to make incremental backup fails. I back up to an external USB hard drive, but it takes most of a day to restore, which I've had to do once. I also tell it to verify after making an image and that always takes longer than it took to make the image. Any suggestions would be helpful. I fixed the link. Here is it again: Why didn't you restore from a Disk Image? Desktop System Software (DSS) or Notebook System Software (NSS) - A vital utility that provides critical updates and patches for the operating system. If you are reinstalling Windows or updating all drivers, it is important that this software be installed first. This is located under the System and Configuration Utilities Category on the Drivers and Downloads page. Chipset - Helps Windows control system board components and controllers. This is located under the Chipset Category on the Drivers and Downloads page. PCMCIA/Smartcard controller located under the Security Category on the Drivers and Downloads page. Intel Storage - Intel Matrix Storage Manager located under SATA Drives on the Drivers and Downloads page (only for Intel chipset computers). Audio Adapter - Enables and enhances the audio controller. This is located under the Audio Category on the Drivers and Downloads page. Video Adapter - Enhances video performance. This is located under the Video Adapter Category on the Drivers and Downloads page. Network Interface Card (NIC) - Enhances the network controller for Internet or network access. This is located under the Network Category on the Drivers and Downloads page. Dell Control Point (DCP) - Controls power management, ambient light sensor, wireless profiles, and security features on laptops. This is located under the Applications on the Drivers and Downloads page. The DCP is split into three separate programs with each one controlling different aspects. It may not be necessary to install all three parts of DCP depending on the system configuration.